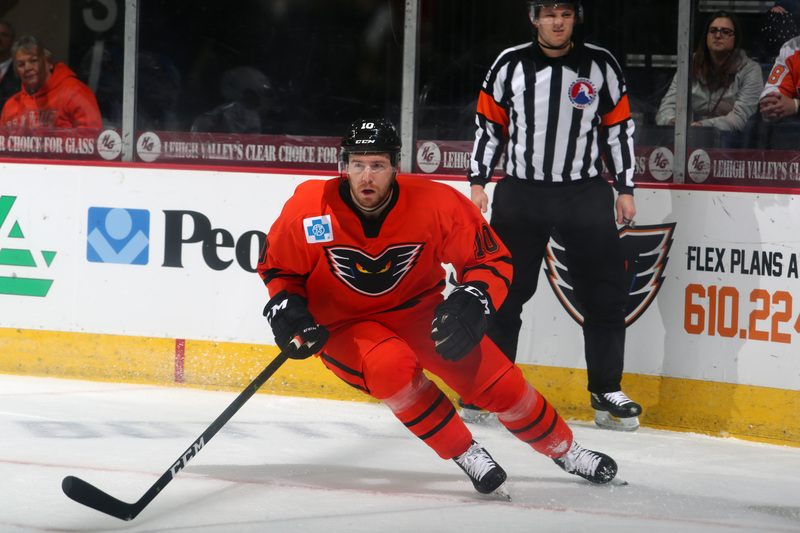 Lehigh Valley, Pa. – The Lehigh Valley Phantoms (23-15-3-2) went to overtime for the fourth straight game, and to a shootout for the second time in three games, as they took this one 2-1 against the Hershey Bears (20-20-0-2). 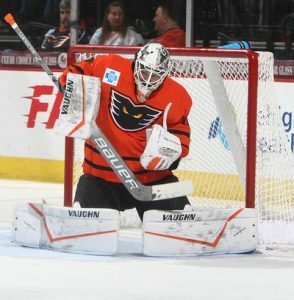 Alex Lyon came up huge in net for the Phantoms once again, making 40 saves on 41 shots and AHL All-Star, Greg Carey scored the lone regulation tally, as well as the shootout winner to give Lehigh Valley two points against a red hot Hershey Bears team. Hershey was able to get things started in this one, 13:08 into the first period as Garrett Pilon danced into the Phantoms zone and fed a pass over to Connor Hobbs between the circles. Hobbs pulled the trigger on a one-timer and rang it off the iron and in to give the Bears a 1-0 lead. The Phantoms got a couple good chances of their own, including Carsen Twarynski firing a rocket that beat Ilya Samsonov but rang off the post and stayed out. Phil Myers dangled around two Hershey defenders but had it poked away at the last second and was unable to convert the highlight reel play. The Phantoms were much more aggressive in the second period, tallying 15 shot attempts (compared to just four in the first) but were once again a piece of iron away from lighting the lamp. Greg Carey hit another post for Lehigh Valley as he shot a laser that sent a disappointing “ping” echoing through the PPL Center with 7:30 left in the second. Reece Willcox put his body on the line to keep it a one-goal game with Hershey on a power play with less than five minutes remaining in the second period. With Alex Lyon out of the net to make an initial save, Willcox sprawled out in front of the net and took one off the chest to keep the puck out and kill off the penalty. Hershey went 0/5 on the power play in the game. Lehigh Valley was able to even the game 3:34 into the third thanks to a one-time blast from Greg Carey. Justin Bailey was able to draw two penalties on the same shift to give the Phantoms a 5-on-3 for a full two minutes. With the two-man advantage winding down, Phil Myers was able to connect on a cross-ice pass to the Phantoms All-Star who buried his 20th goal of the season and tied the game 1-1. Carey is now tied for first in the AHL with 11 power play goals. For the fourth straight game the Phantoms would need more than 60 minutes, and for the second time of those four, more than 65. Greg Carey scored the only goal of the shootout in the third and final round to give Lehigh Valley two crucial points over a division opponent. The Phantoms are now 3-2 in shootouts this season. NEXT TIME OUT: The Phantoms take on the Laval Rocket for the first and only time at PPL Center this season as they host RACING NIGHT at 7:05 on Friday, January 25. NASCAR Drivers Timmy Hill and Josh Reaume will be here to meet fans and both their Phantoms sponsored race cars will be in the building.